Top Five Mid-Range10+ Cup Rice Cookers (3-5 cups) which are great for saving counter space, as well as some in the medium-size range (5-10 cups). 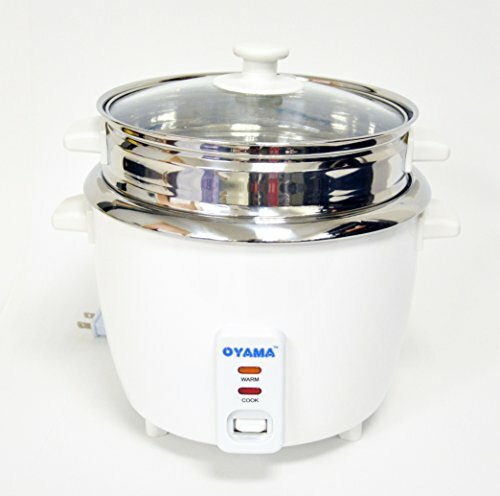 They are priced as budget rice cooker reviews, mid-range cooker reviews, and high end cooker reviews. This first option has a number of advantages for rice cooking. One of these is that it has a capacity of up to 20 cups cooked rice, which is a huge amount of rice. As with any rice cooker, you don’t have to fill it to max capacity, so you could still use this model to cook just a few cups of rice if you wanted to as well. Beyond the capacity, the rice cooker is also powerful because of the functions that it offers. In this case, there are 8 different modes programmed into the device, which cover basic functions, along with some more unusual aspects, such as the ability to make cake and soup. Another interesting thing with this model is that it uses an approach called fuzzy logic. This is a programming approach and it’s fairly common in more expensive rice cooker models but is fairly unusual in models around this price range. The use of fuzzy logic essentially serves to make the rice cooker more ‘intelligent’. Because of this, the model will make adjustments to time and temperature as the rice cooks. Doing this helps to make sure the rice cooks perfectly, regardless of outside conditions and the type of rice that you’re using. 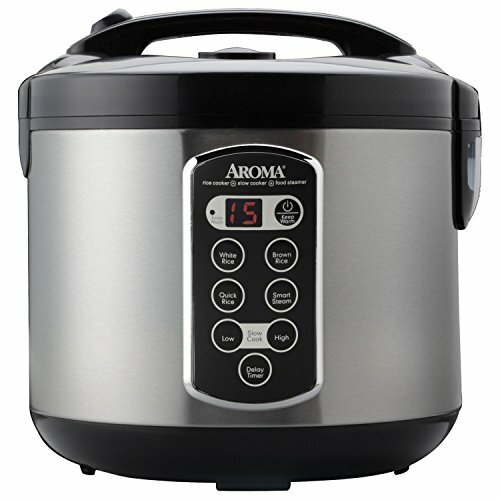 This rice cooker comes from Aroma Housewares and that is a fairly popular brand when it comes to rice cookers. Additionally, this is another option that has a range of different features and functions. Many of those aspects are the same as the previous model that we mentioned, however, this rice cooker does also have a few unusual things to offer, including the ability to act as a slow cooker and a steamer. Because of this, the rice cooker ends up being an incredibly versatile tool and provides many more options than most other rice cookers out there. It is also worth noting that this rice cooker is a popular choice among customer on Amazon, scoring an average of 4.4 stars. The product description even goes as far as explaining how to measure rice if you do lose the measuring cup, which is something that most other brands don’t even bother explaining. Overall, the product ends up being a powerful choice, especially as it is also relatively low in terms of price. This rice cooker model stands as a stark contrast to the previous two that we mentioned, as it is very light on features. In fact, users simply have the option of turning the cooker on and off, although the product does still have a keep warm mode, which it switches to after the rice is cooked. Additionally, this rice cooker does also double as a steamer. This allows you to cook vegetables using the steam that is produced from cooking the rice. That approach can work well, although it often takes people a while to figure out the best timing, as steaming only really works while the rice is cooking and actively producing steam. Even though the product itself is pretty simple, there are a couple of appealing things about its overall design. One of these is the glass lid, which makes it easy to see how the rice or steamed food is progressing. The other things s that this model uses a stainless steel inner pot, rather than a Teflon-covered pot. This is a fairly unusual aspect, as most other rice cookers will use a non-stick pot. However, the stainless steel approach can be an advantage for anyone worried about the impact of Teflon coating on food or on health. This model is another example of a fairly simple rice cooker. Once again, users simply have the option of turning the cooker on and off. In many ways, this simplicity can be an advantage. After all, having a large number of features can make a product much more complicated to use. Additionally, those features aren’t going to be all that useful if you just want to cook rice and nothing else. While there may not be many features, the product does still stand out because of the brand, which is a fairly popular choice for rice cookers. Additionally, some people may like the flowers on the rice cooker or the overall appearance and that may be a reason to pick this model over what else is on the market. 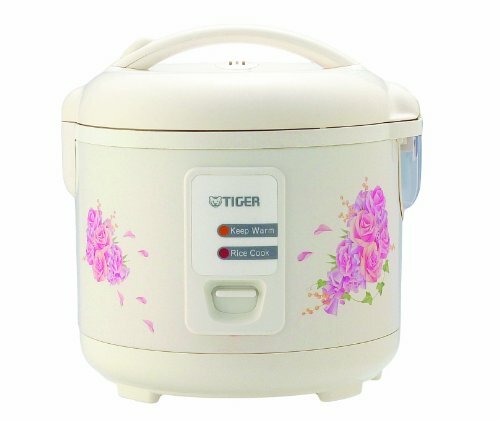 This rice cooker may be another basic one but it also a little bit different than the other models that we’ve discussed. 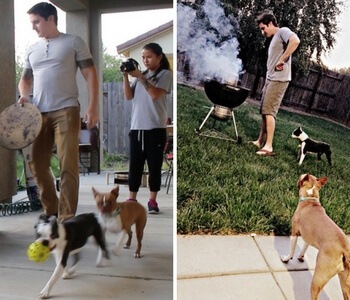 The biggest difference comes from the design, which also means that this rice cooker looks a little bit unusual. Additionally, this is another product that uses stainless steel, so it’s a good option for anyone who is concerned about using aluminum or Teflon coating. The reviews for the product suggests that it works well and can still be used for many different types of rice. 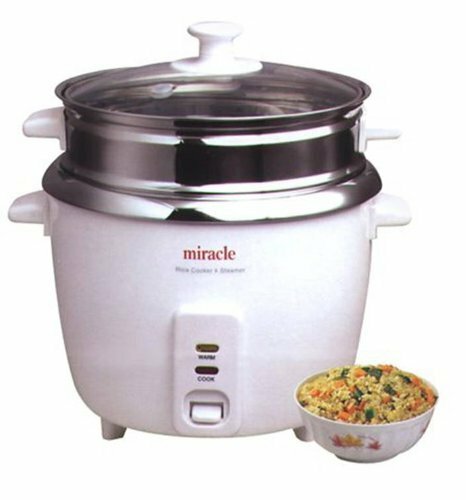 At the same time, this is also another model that offers the steaming function, so you do still have some versatility with your rice cooking. It can sometimes be difficult to pick the best model for kitchen appliances, simply because there are often many differences between the options. However, in this case, the choice is easy. Of all the models in this list, we recommend the Aroma Housewares Professional Rice Cooker without any hesitation and this model was better than the others in just about every category. The most compelling thing about this model is simply the range of features. Those features mean that you aren’t stuck with a product that can only be used for one function. Instead, it is an excellent rice cooker, with options for multiple types of cooking and rice, while the item also functions as a slow cooker and a steamer. At the same time, the rice cooker gets consistently positive reviews from people who have used it and it seems to be one of the better-performing rice cookers out there. Finally, the product even manages to be the least expensive item on this list and is around a lot cheaper than most of the other entries. Because of the price alone, it may well be worth choosing this model even if you don’t think that you would need all of the various functions.